East Anglian value retailer QD Stores is helping a Clacton woman suffering from terminal cancer in her bid to raise £25,000 for local cancer care. 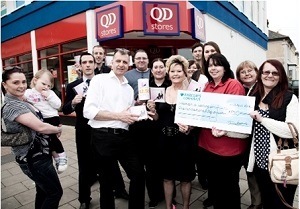 at her local QD branch since hosting its official launch last month (April) raising £150 in just one day. airplay on local radio station Dream 100. Prominent fund-raiser Wendy, 53, and local musician Charlie Rogers recorded and released the song in a bid to provide extra Macmillan Cancer Care nurses to help fellow cancer sufferers as well as chemotherapy treatment facilities at Clacton Hospital. When QD Clacton store manager Maria Jeffrey read about Wendy's aim, she wanted to help. Says Maria: "I was struck by Wendy's bravery and asked our head office in Norwich if we could host a launch for the CD and sell copies. They said yes and the rest is history!"